An ECHO Leaf Blower will make quick work of any yard clean-up. 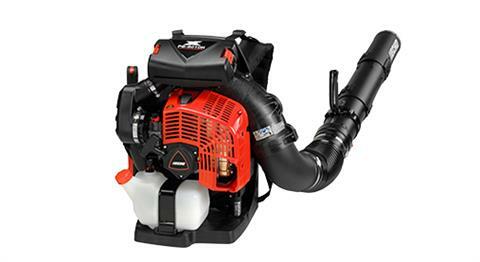 The line-up of Power Leaf Blowers, features many operator-friendly features like padded backrests and shoulder straps, Posi-loc™ tubes for secure pipe connections, and comfortable handles with “cruise control". ECHO's backpack blowers are available in either tube-mounted or hip-mounted throttles. 79.9 cc engine with new fan/volute for industry-leading blowing performance. 91 mm (3.6") diameter blower pipes for maximum air flow. Fan intake circulates air and cools user's back. 44 N of blowing force. Carbon-fiber frame and fan case for light weight. Heavy-duty backpack straps for all-day comfort. Patented wear ring reduces tube wear. Top-mounted tool-less filter access for easy in-field cleaning or maintenance. Dry (with standard pipes) - 24.8 lb.